When you are working in a CAQDAS package there will be a number of windows and it is important you know how to minimise (make smaller) and maximise (make bigger) windows. You can also drag a window to decrease or increase the size. This will allow you to work within the windows at a size that suits your style of working. In the top right corner of every window are 3 buttons. If you are still working in a window but do not need to look at it while you work in another window you can click on the 'minimise button' and the window will then appear as button in the task bar at the bottom of the screen. When you want to work in the window again you can click on the relevant button in the task bar to restore the window. When you are working in a window at full size (see figure. 1) you may decide to reduce the size so you can work in another window at the same time. 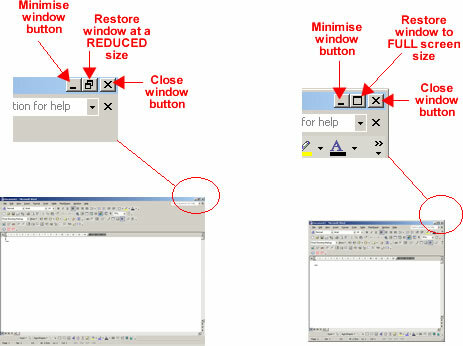 You can reduce the size by clicking on the 'restore button' this will reduce the size of the window (see figure. 2). If you require the window any smaller you can place the mouse cursor at the edge of the screen when it changes from a white arrow to a double headed black arrow you can drag the edges of the window to the size you require. When you want to return the window to full screen size click on the 'restore button'.